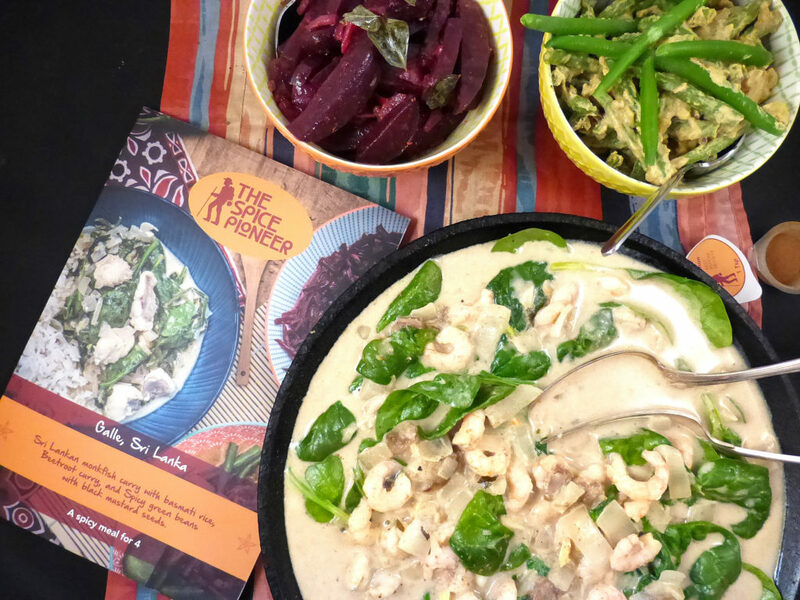 I love curries and spicy food, so when I was asked to review The Spice Pioneer Subscription Box, I was on it like the proverbial. Take a look at how I found the whole experience! 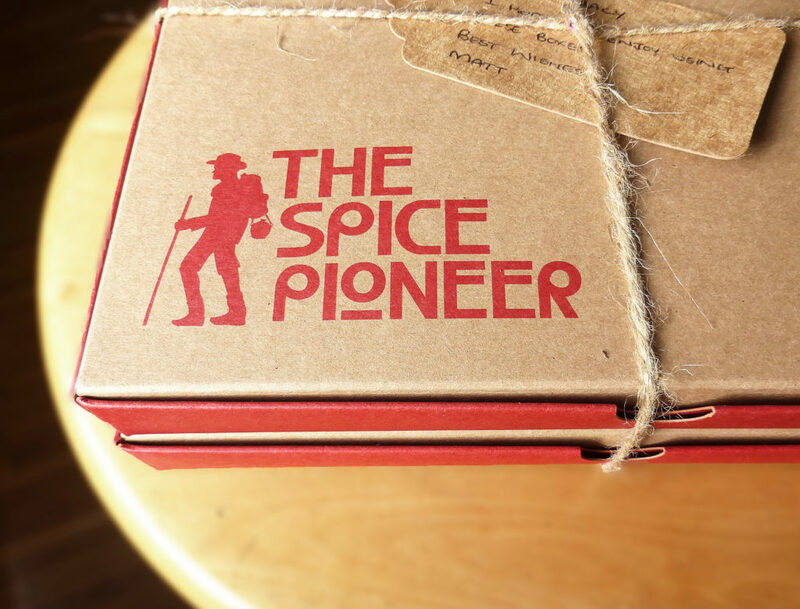 What is The Spice Pioneer Subscription Box? 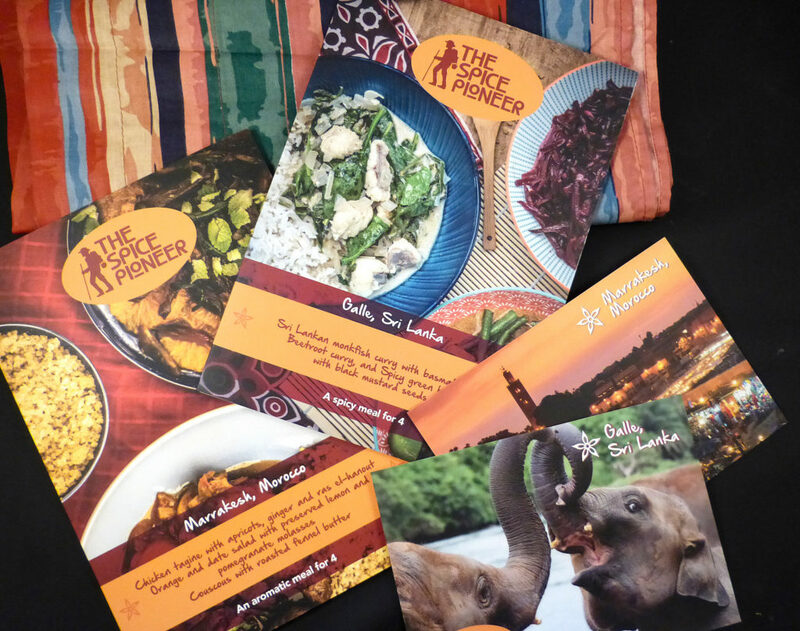 The Spice Pioneer is a monthly subscription box offering authentic and exotic herbs and spices, straight to your door. You provide the main ingredients, they give you the wonderful (and often hard to get hold of) spices which allow you to turn everyday food into amazing meals. Before I get to the rudiments, I am sure that you, like me, have seen the million and one subscription boxes popping up all over the place. There’s a reason for this: our lives are hectic and there are ton of other things we’d rather do than think about (and organise) food. Allow me to be brutally honest: in the past, the mere thought of subscription boxes has left me cold. I don’t like being tied or bound to anything (if I can help it). So, as you might imagine, I wasn’t expecting a whole host of fireworks to be going off when reviewing this particular box. 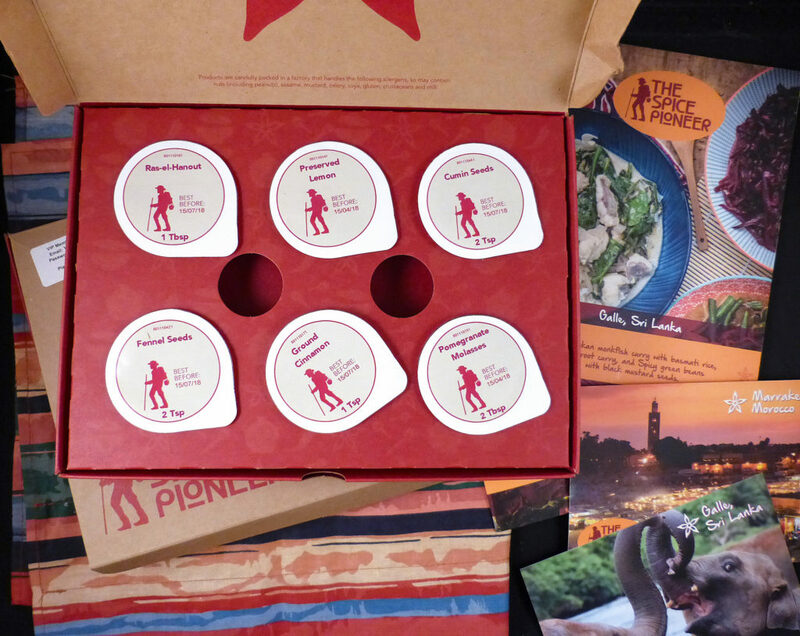 However, when checking out the Seasoned Pioneers website before my box arrived, my curiosity was more than a little piqued. A beautiful cascade of colour and vibrancy hit me and I spent way too long looking at the different spices. Do you know what ras el-hanout is used for, or that beetroot can be powdered? I didn’t. So, how does it work? Once a month, The Spice Pioneer subscription box, full of intriguing spices, is sent out to you. Each one has a different theme (place) and the ingredients and recipes are centred around it. You can’t choose your box but there is an opportunity to re-order previous editions. The boxes are designed to fit through your letterbox and as none of the ingredients need refrigeration, and have a shelf-life of up to six months, you don’t need to use them immediately. 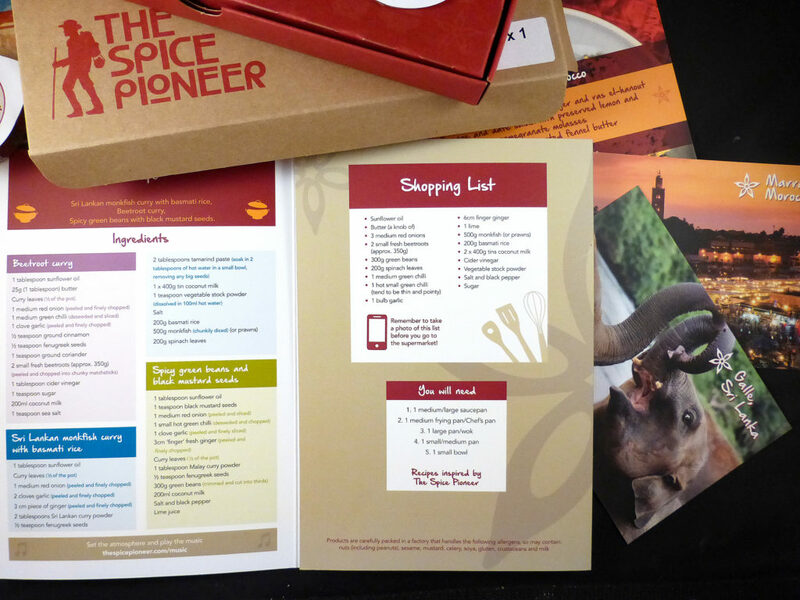 I waited eagerly for The Spice Pioneer subscription box to drop through my letterbox. Well, not literally. 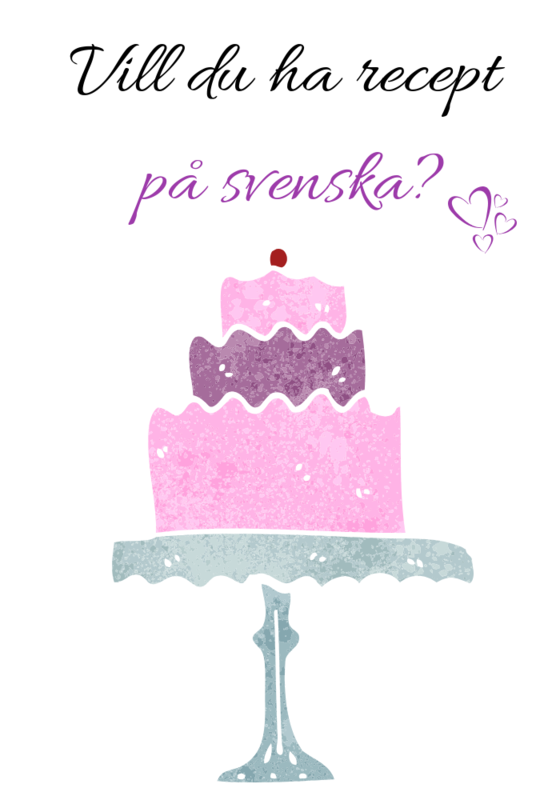 We don’t have letterboxes in Sweden. We have post boxes at the end of our drive or garden. When it turned up, I was surprised to see not one box, but two. They were brown paper boxes tied together with a bit of rustic string and I have to say, looked very pretty (as pretty as packaging can be, anyway). The two boxes I received were for Galle, Sri Lanka and Marrakesh, Morocco. My heart leapt when spying the curry dishes as I love a good old bit of spice, and have never eaten anything from Sri Lanka. However, I have to be honest and admit that I didn’t quite have the same reaction when I saw the one with Moroccan food. Although I’ve never eaten a tagine, I really don’t enjoy fruit in otherwise savoury food. I am weird, I know. I remember a friend once making me a curry with bananas and apples and well, let’s just say it is not something I ever want to repeat. Opening the boxes, there were eight pots – six large and two smaller ones – in each. 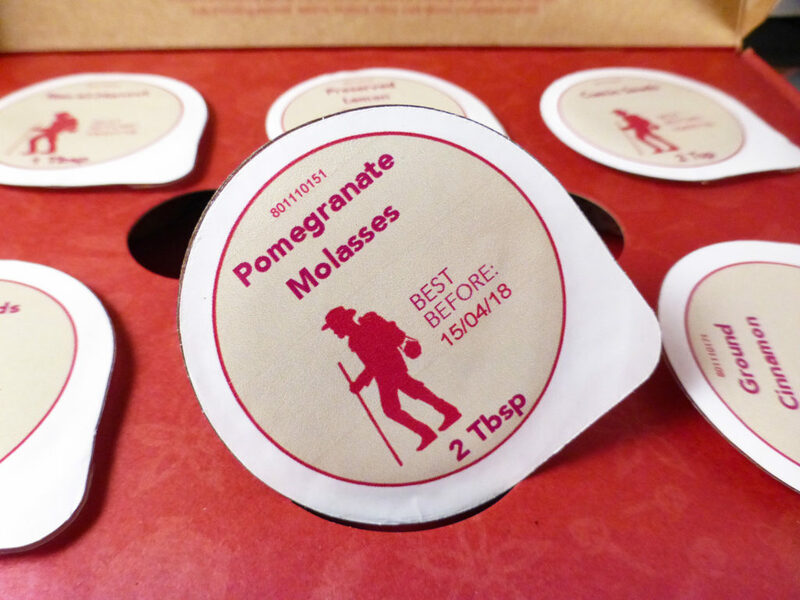 The pots were clearly labelled with the name along with a best before date and the measurement/weight of the ingredients. 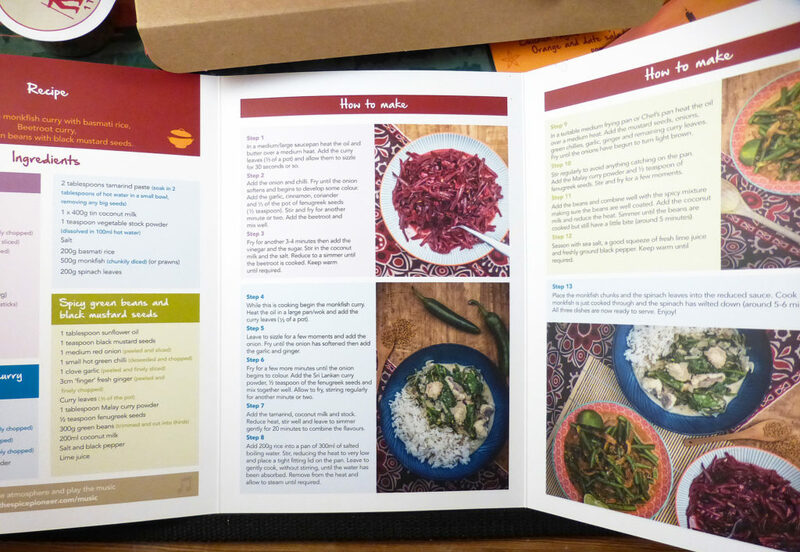 Along with the spices, there were booklets made of thick, durable paper (you can use these again and again). 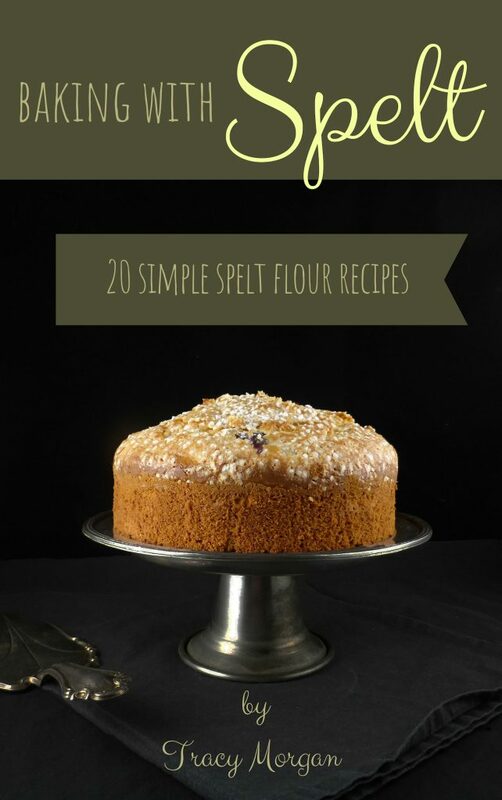 Included in the booklet is a shopping list to help you pick up the additional ingredients you need, along with the actual recipes and instructions. 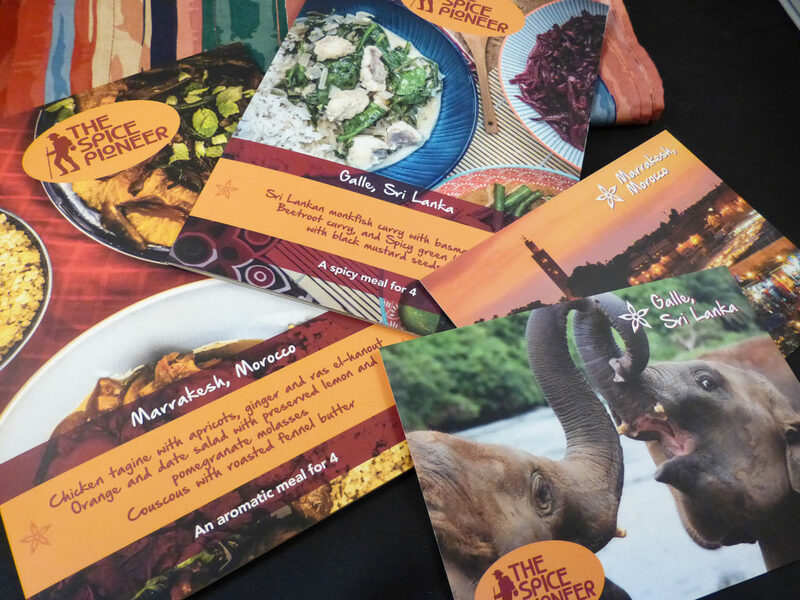 There is also a postcard from The Spice Pioneer himself where he relays snippets of the place he is visiting (where the dishes originate from). I have to say I was impressed. The colours were eye-catchingly vibrant and the pictures mesmerising. Everything screamed quality with a capital Q and it all had such undeniable attention to detail. 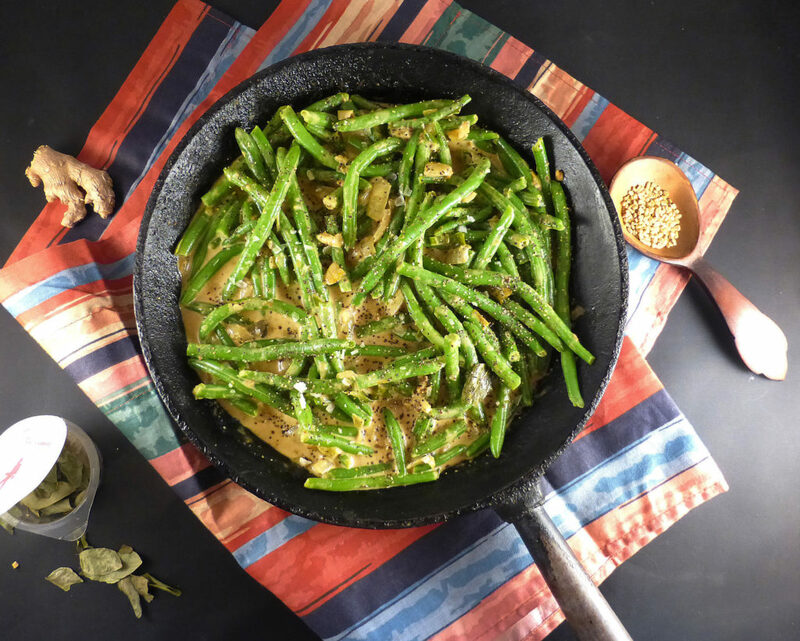 Using The Spice Pioneer subscription box to make the dishes could not have been easier. Seriously. The hardest thing was peeling an onion. As mentioned, you are provided with a shopping list of the ingredients you need and to make it even simpler, they remind you to take a photo so that you don’t need to rely on your memory when trundling up and down the aisles. This person needs all the help she can get in that department. Each box contains the recipes, ingredients list and spices for three different dishes. They are clear, no-nonsense instructions that are well-structured and easy to follow. Each dish is quick to make with minimal preparation and fuss. The longest cooking time of the three was 20 minutes. Let’s concentrate on the Sri Lankan box (as this is the only one I have tested so far). The star of the show was monkfish curry, with beetroot curry and spicy green beans with black mustard seeds as side dishes. As suggested, I used prawns as an alternative to the fish. The other additional ingredients (you need to buy) were coconut milk, spinach, red onion, garlic, ginger and vegetable stock, all of which I consider pretty basic essentials in my house. I was particularly thrilled to use the tamarind paste and Sri Lankan curry powder as I’d never cooked with either before. The end result was a fragrant dish that was what I consider fairly mild in flavour, with the tamarind paste offering up a complementary sour element. We served ours with basmati rice as recommended and it’s safe to say the whole family enjoyed the dish as there wasn’t a drop left. Now this one was intriguing. I love a good old cheese and pickle beetroot sandwich but I’ve never used it in cooking, let alone a curry. It was interesting. As with the monkfish/prawn curry, there was a more subtle flavour rather than lip-burning spice. It was nice but I am not sure I’d eat it again. My partner (a trained chef and the most adventurous of us all), really liked it and my 13 year old ate a spoonful. The ten year old wouldn’t even entertain it. The additional ingredients needed were: beetroot, red onion, green chilli, garlic, cider vinegar, sugar and coconut milk (although I omitted this). Again, nothing you will have to search too hard for or break the bank over. This recipe was definitely the spiciest of the three dishes with a gorgeous, jab to your throat, intensity of flavour. 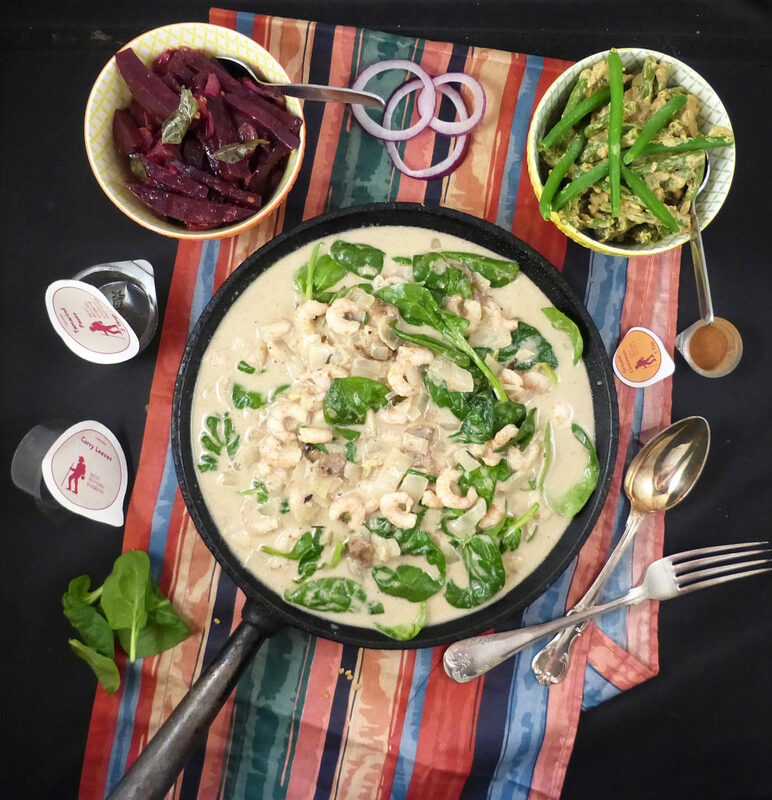 Additional ingredients required were: red onion, green chilli, garlic, green beans, lime juice and coconut milk. Who needs to get their hands on The Spice Pioneer? Well, you won’t be getting your hands on the Spice Pioneer himself at all because he is off travelling the world at large. Seriously though, as amazing as it all was as a package, I don’t think it is going to suit everyone. This is not a subscription box for families and certainly not young kids. And although the instructions were simple and the meal easy to prepare and cook, it did feel a little faffy with plenty of peeling to be done. One thing it isn’t is a weekday meal. The boxes are described as meals for dinner parties and before even reading this, I had the same view. If playing the host is your thing, these will thrill the pants of you. The hard work involved in finding authentic dishes with elusive, exotic ingredients has already been done. You can go out and buy the remaining items knowing you will have an end result that will impress. 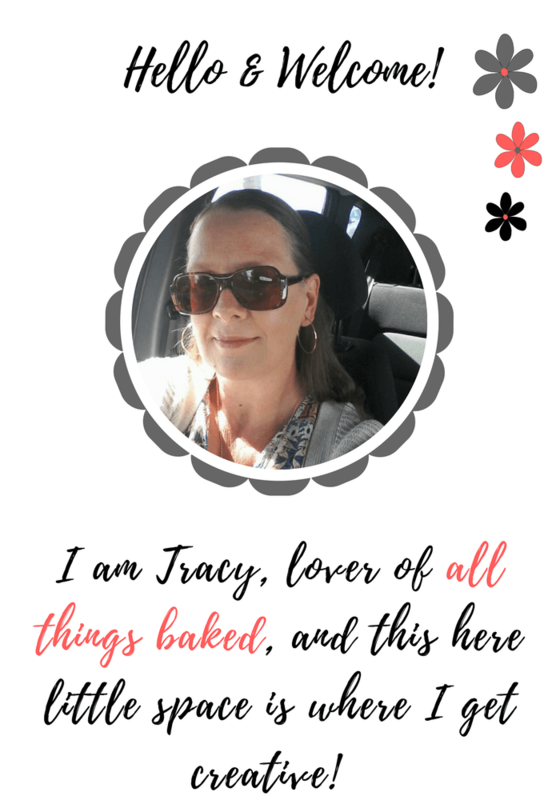 There were many things I liked about The Spice Pioneer Subscription box. The simple, easy to read recipes and unusual spices made for an interesting and enjoyable experience. 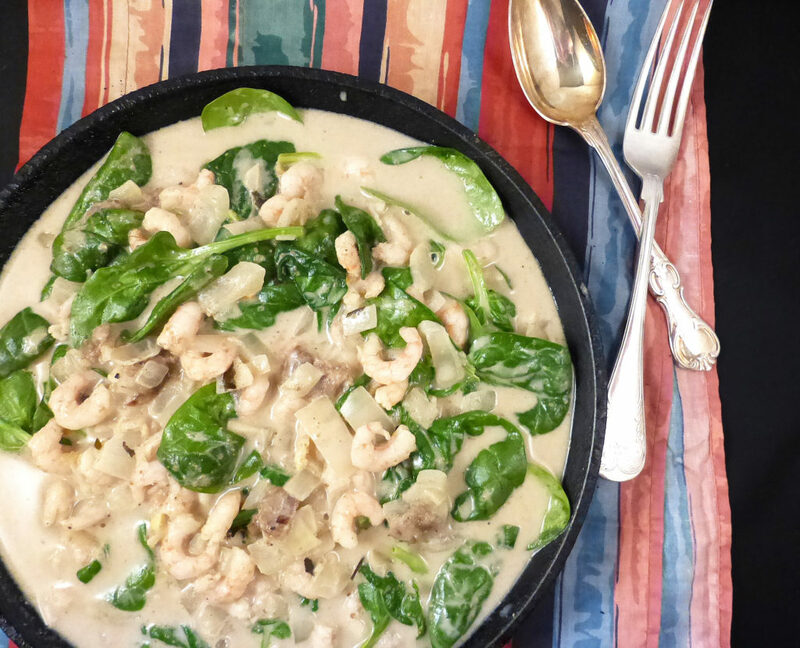 The recipes have been well thought out – for example, the coconut milk measurements across the three meals came to two tins. They curry leaves were also divided perfectly between the dishes. I really liked that there was no waste or ingredients left over. 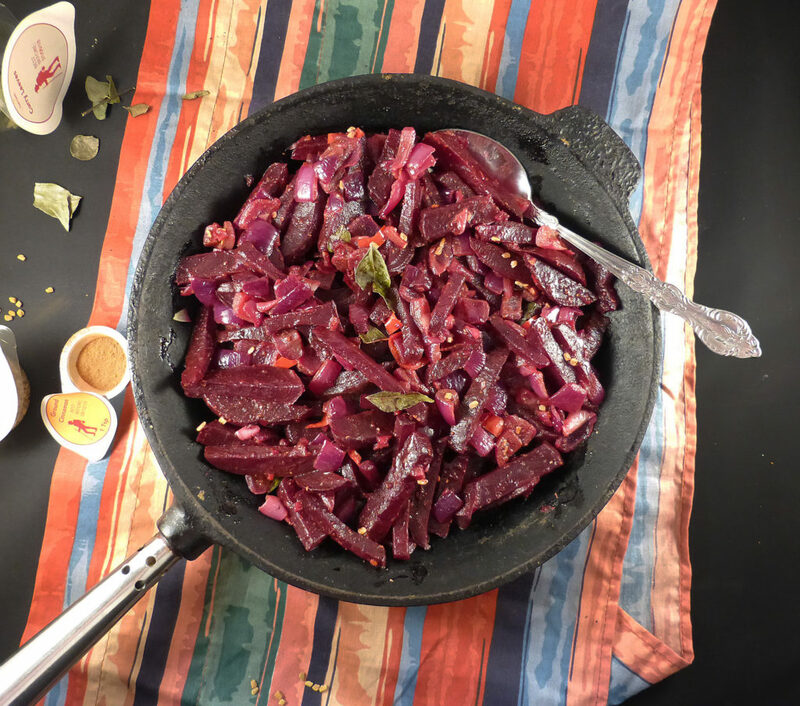 I also found that the recipes were adaptable – I used cooked beetroot and frozen green beans as opposed to fresh as stipulated in the recipes. Lastly, the quality right across the board, from spices to printed information and packaging, was first class. What didn’t I care for? I don’t like the fact that you can’t choose what’s in your boxes. My biggest concern would be that something not to your taste would drop through your door. And as highlighted above, it did. I also don’t like the idea of being tied to a subscription. Food wise, in general, I personally found the meal a little bland, which is odd given the exquisite range of spices and herbs used. However, I must point out that my partner didn’t find it bland at all. I also felt there was too much coconut milk. Totally understand it is an integral part of Sri Lankan cuisine but I am not sure it needed to be included in every one of the three dishes. Do you like entertaining or have dinner parties at least once a month? Are you intrigued by ingredients you’ve never used before, or those harder to get hold of? Does quality matter to you, where a great deal of thought and effort has obviously gone in to a product? If so, then get yourself over to The Spice Pioneer to find out more! I was sent The Spice Pioneer Subscription Box for review purposes. I was not paid for this post and all comments and viewpoints expressed are honest, unbiased and entirely my own.